I’m not sure what it is about the fine line between the Best Idea in the World and the Stupidest Idea in the World, but sometimes that line is incredibly blurry. 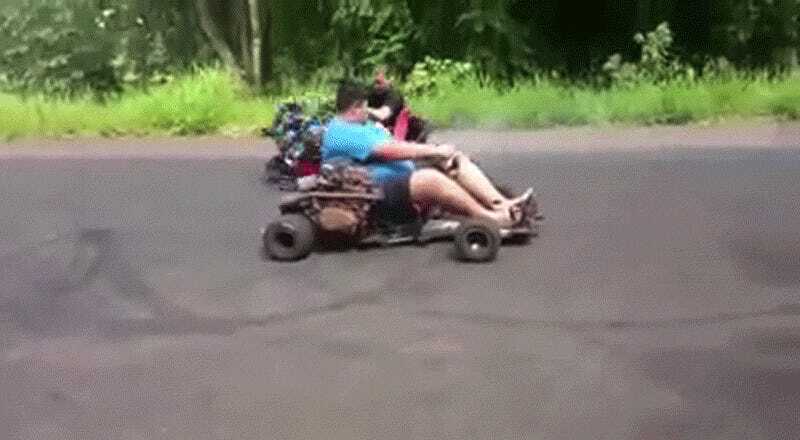 I think this guy having a great time with a four-cylinder turbocharged full-sized car motor in a go-kart wearing no helmet is doing his part to blur that line. Sure, if you go by the statistics of an insurance adjuster, at that moment this guy have a lifespan measurable in minutes, at best. But this is also a guy having what looks to be an incredible time. All I know about this video so far is that it’s from Brazil. I’m not even sure what car that engine came from, but you do have to admire the clever engineering and packaging design that went into cramming that engine (and transmission, somehow) onto that kart. The radiator is mounted at the rear, and I can only guess that the driver is sitting on some sort of transaxle setup. Based on the smoke, it looks like power is going to both of those tiny kart-wheels, but I’m not sure there’s actually a differential or anything like that. Would there even be room? Regardless, just enjoy the raw, uncut bonkers-ism of this video. Even if this sort of thing never catches on, this design could be applied to the most exhilarating suicide machine outside of that weird roller coaster design that kept popping up online.